A series of favourable budget announcements have revived interest in India’s National Pension Scheme (NPS), a “defined contribution” pension plan that invests in a diversified basket of financial assets such as stocks, corporate bonds and government securities. Its chief advantage over existing government-sponsored pension plans is that it allows subscribers to invest in equities (up to 50% of their funds) which should help them generate higher returns than they would with bonds alone. The NPS does many things well. Its management fee is only 0.01% of assets, compared with the annual expense ratio of 1.75-2.75% for your typical balanced mutual fund. For people who have little inclination to figure out their optimal asset allocation, the NPS offers an “auto choice” (or “lifecycle”) option that steadily reduces the allocation to equities and increases those to bonds (particularly to safer government bonds) as the saver approaches retirement. The requirement that NPS equity investments (termed “Asset Class E”) be made in an index fund (benchmarked to either the BSE Sensex or the NSE Nifty) also eliminates fund manager risk. Bad fund manager choices can hurt fund returns: an S&P Dow Jones study found that more than half of Indian large-cap equity funds and bond funds failed to outperform their index over a five-year period (ending June 2014); four out of five government bond funds also fell short of their benchmark. Even with fund manager risk minimised, stock market volatility is a reality, which is one reason why trade unionists have long resisted efforts to let the Employees Provident Fund Organisation invest a sliver of its Rs 650,000 crore (US$104 billion) corpus in equities. Because not all savers can stomach such volatility, the NPS limits equity exposure to 50% or less, and ensures investment in a diversified basket of assets. So what might the problem be? Unlike equity investments in the NPS , the Pension Fund Regulatory and Development Authority (PFRDA) does not prescribe a particular index for investments in government securities (“Asset Class G”) or corporate bonds (“Asset Class C”), leaving it to fund managers to choose their investments (subject to detailed investment guidelines). This set up leaves NPS bond investors exposed to fund manager risk in a way that they are not with their equity investments. Long-term bonds invariably expose investors to interest rate risk: the longer the tenor of a bond, the more its value will fluctuate with changes in interest rates. This can be good for investors when interest rates are declining (since bond values then rise) but can reduce the value of those bonds when interest rates rise. The sensitivity of a bond or a bond fund to interest rate changes is measured by its duration. The issue here is not that NPS subscribers have to deal with inevitable interest rate risk, but that NPS fund managers are effectively permitted to bet on interest rate movements and, to an extent, on credit quality. This exposes unaware savers to fund manager risk in their NPS bond investments. The chart below measures the difference between the duration of HDFC Pension’s government securities fund and the CRISIL Gilt Index. 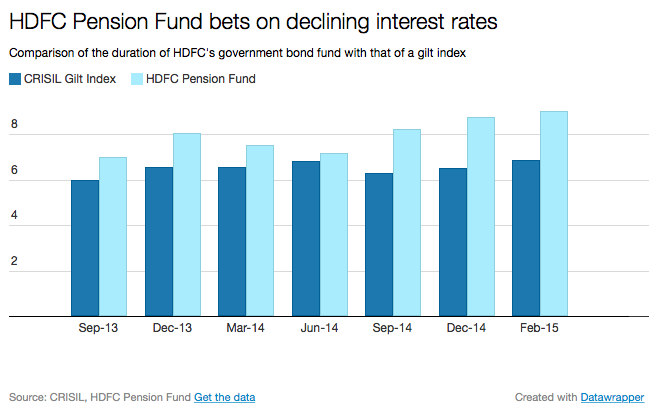 It shows that, in June 2014, the interest rate sensitivity of HDFC’s government bond fund was very close to the index’s, but had increased greatly in comparative terms by December 2014. The fund manager appears to have chosen to take on greater interest rate risk than the broader market in an effort to juice returns on the assumption that interest rates are headed downwards. The chart below shows how NPS fund managers have taken on varying amounts of interest rate risk in their respective government securities portfolios. As on 28 February 2015, Kotak Mahindra had taken on the least risk vis-a-vis the CRISIL benchmark while ICICI Prudential had taken on the greatest. 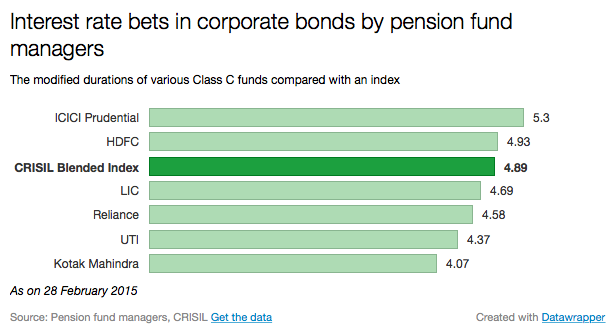 Asset Class C represents corporate bonds. Corporate bond funds tend to take on less duration risk and more credit risk to generate higher returns, and the NPS is no exception. The chart below show the varying spread between the HDFC Pension corporate bond fund and an ad hoc index that is an 80-20 blend between the CRISIL AAA Long Term Bond Index and the CRISIL AA Long Term Bond Index. 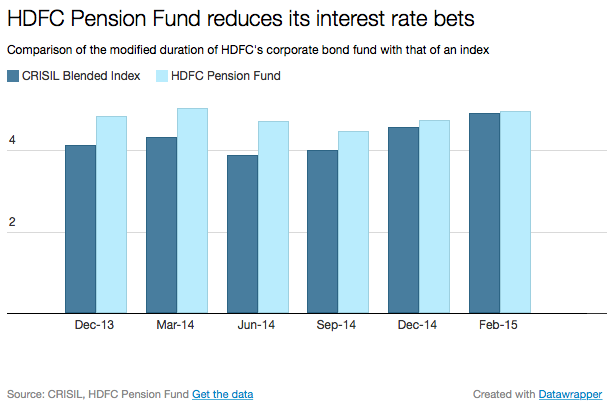 It would seem that HDFC started off more aggressively but has over time aligned its duration with the broader market. Below we have a comparison among different pension fund managers and the amount of interest rate risk they have taken on vis-a-vis our index. ICICI Prudential appears to be the most aggressive and Kotak Mahindra the most conservative here, and the problem is that NPS subscribers have no easy way of knowing this. Finally, the chart below demonstrates how corporate bond fund managers have taken on varying levels of credit risk. Note that they are well within the prudential limits set by the PFRDA, but some funds appear more conservative than others. To summarise, the argument is not that these funds are being managed poorly or irresponsibly, but that NPS bond investments are being exposed to fund manager risks in way that their equity investments are not. Savers should be, and indeed are, free to take on these risks if they want higher returns by voluntarily buying into actively-managed debt mutual funds, but a pension fund doesn’t seem to be the best place for an aggressive debt strategy. At a minimum NPS subscribers should be given the option to invest in bond index funds and provided all the information they need to make an informed choice.